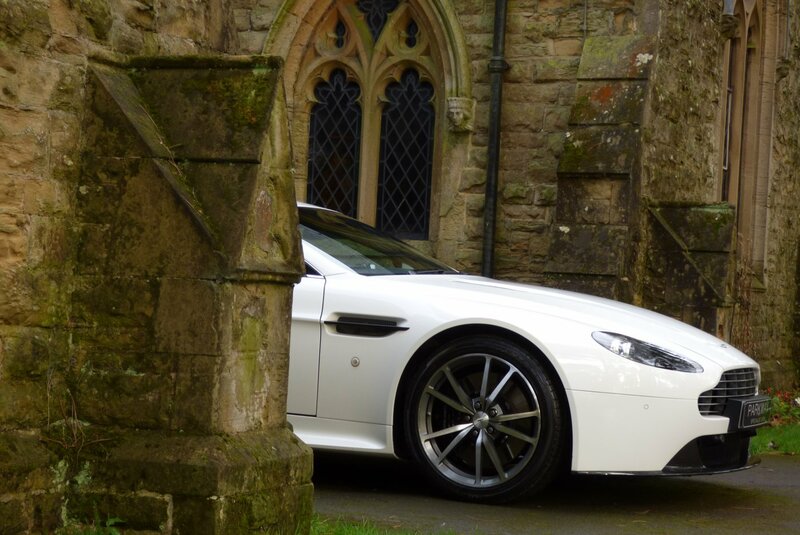 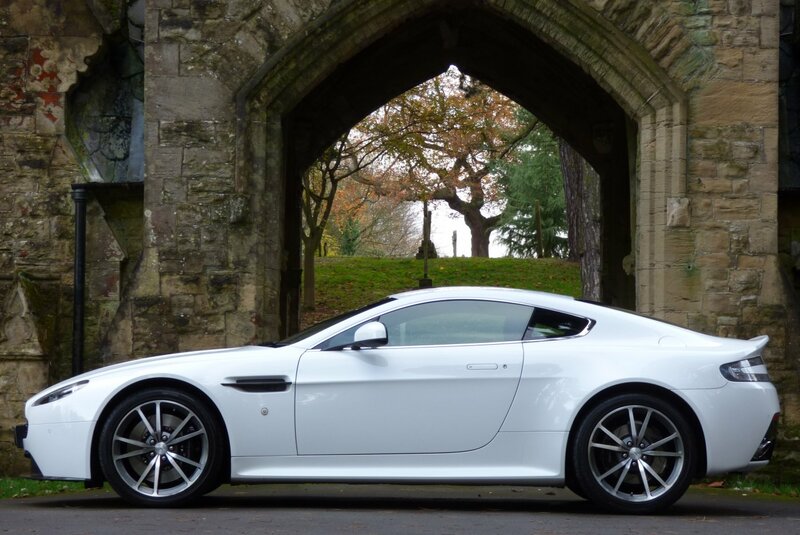 The Production V8 Vantage Was Introduced At The Geneva Motor Show In 2005 For The 2006 Model Year. 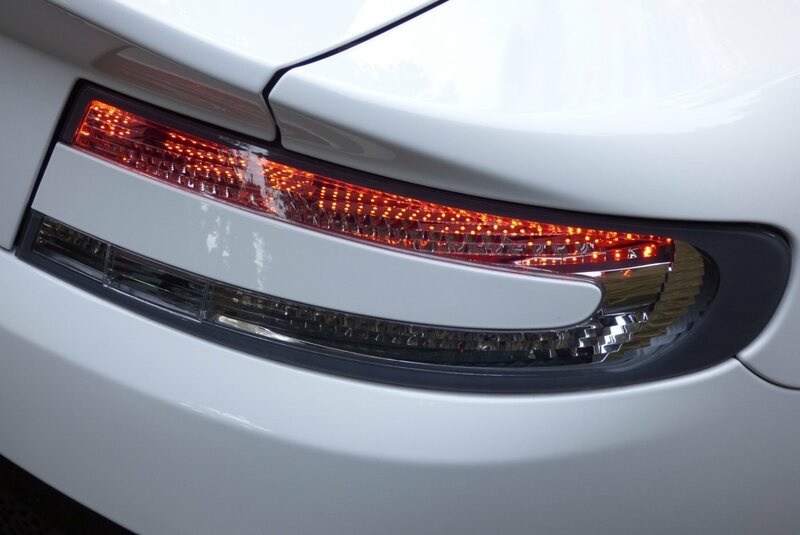 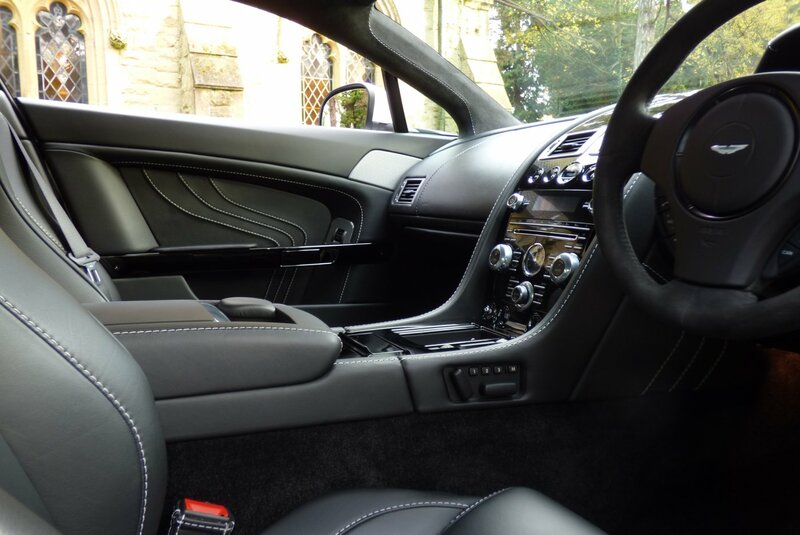 The Two Seat, Two Door Coupe Had A Bonded Aluminium Structure For Strength And Lightness And With The 4.3 V8 Power Delivery, Created An Instant Hit With The Motoring Press And Excited New Owners, However The Introduction Also Gave Porsche A Few Worries. 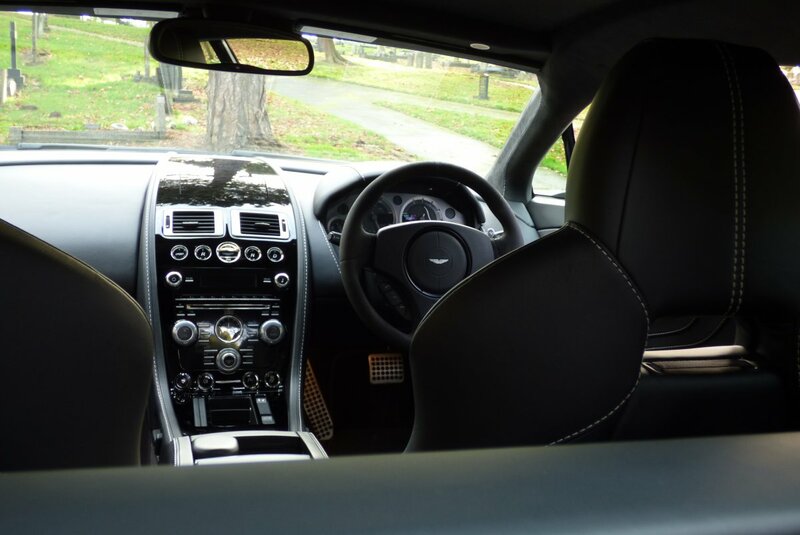 These Are Seen As Great Drivers Cars, But Still With The Advantages Of A Relax Driving Position And Of Course The Characteristic Aston Martin Flair. 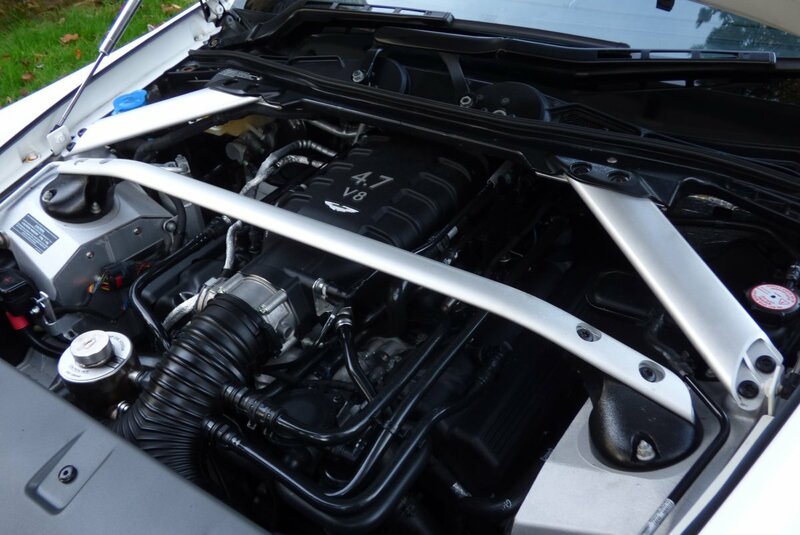 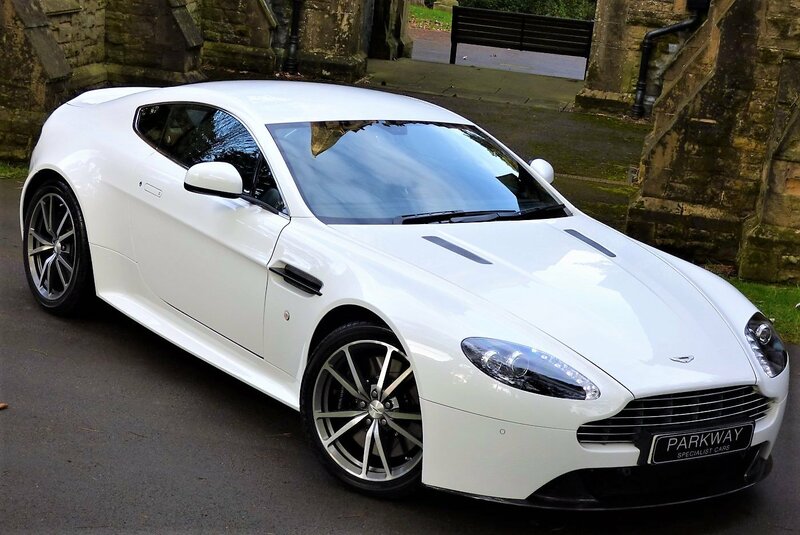 On The 25th Of January 2011, Aston Martin Released The V8 Vantage S, Designed To Produce A More Sporty Driving Experience Than The Entry 4.3 V8 Vantage Model, With This All New Offering To Include An Improved 4.7 Aluminium V8. This Produced A Rather Healthy 430 Brake Horse Power That Would Accelerate Both Driver And Passenger From 0-62 MPH In Just 4.5 Seconds And Climb To A Massive Top Speed Of 189 MPH. 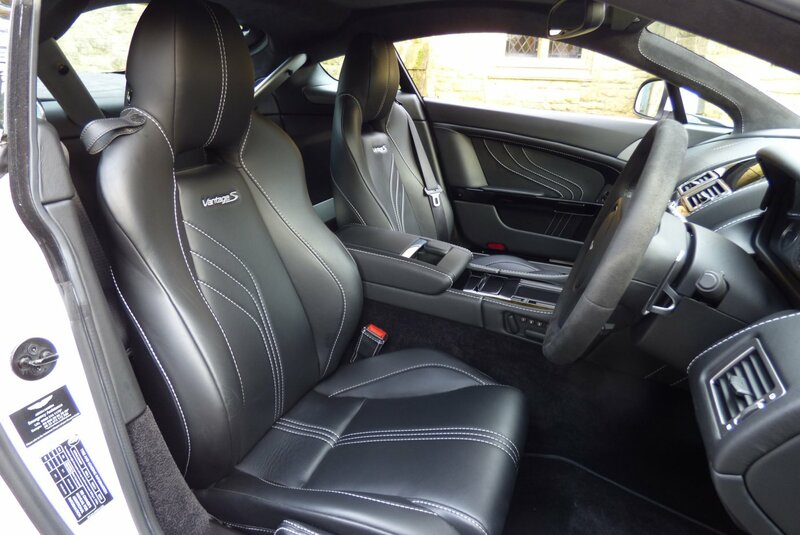 As Part Of These Newer Improved Model Came The Introduction Of The Sportshift II Gear Transmission, Which Was An Option Over The Manual Box, With This Automatic Version Having A Seven Speed Sequential Gearbox, Which Does Work Perfectly On A Combination Of Driving Conditions And Experiences. 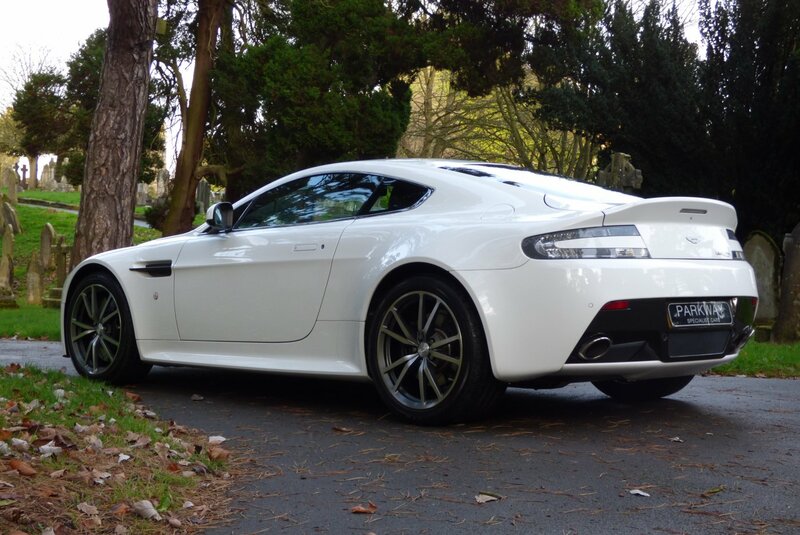 The Vantage S Makes Several Leaps Forwards In All Sorts Of Directions, As The Car Is Sharper And More Refined; Quicker Yet More Civilised; Better To Listen To At Full Exhaust Chat, But Still Less Intrusive When At Lower Speeds. 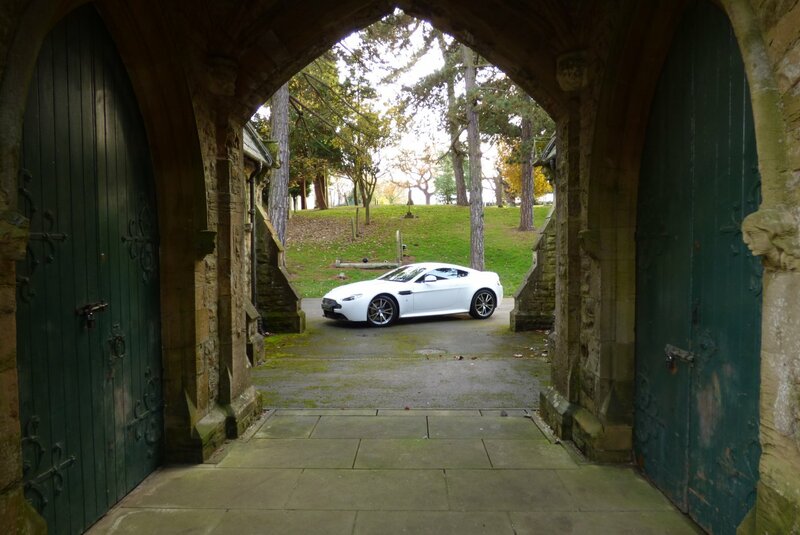 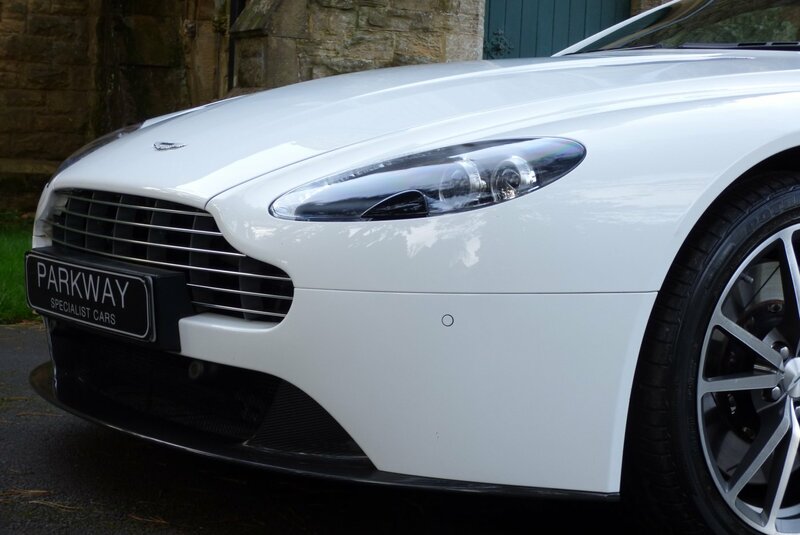 This Fabulous Example Was First Supplied By Lancaster Aston Martin In The September Of 2013, With The First Private Keeper Acquiring The Car In The January Of 2014 And Bearing In Mind That The Car Has Just Recently Celebrated Its Forth Birthday, The Car Has Had Very Minimal Miles Applied Since That First Registration Date. 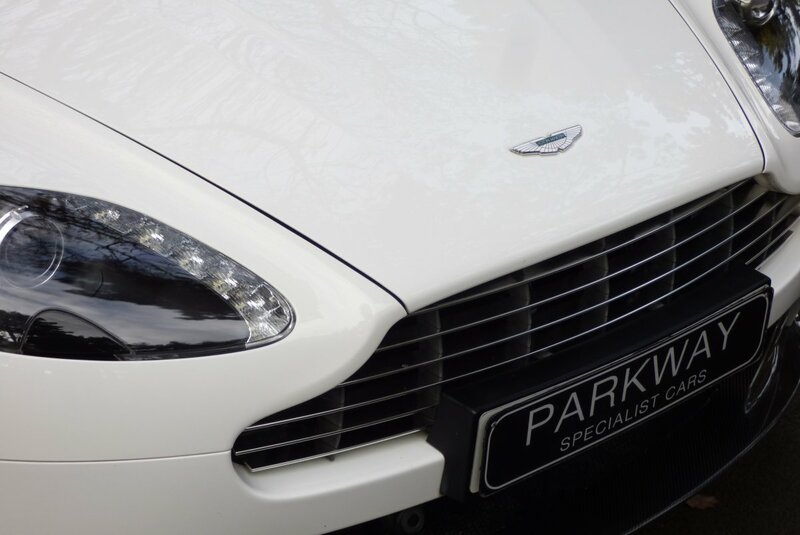 Regardless Of This, Our Special Example Has Been Treated To An Extensive Past Aston Martin Service Inventory With Historical Visits Logged At 4458, 7663 & 8285 Miles, With The Last Completed By Stratstone Aston Martin In The June Of 2017. 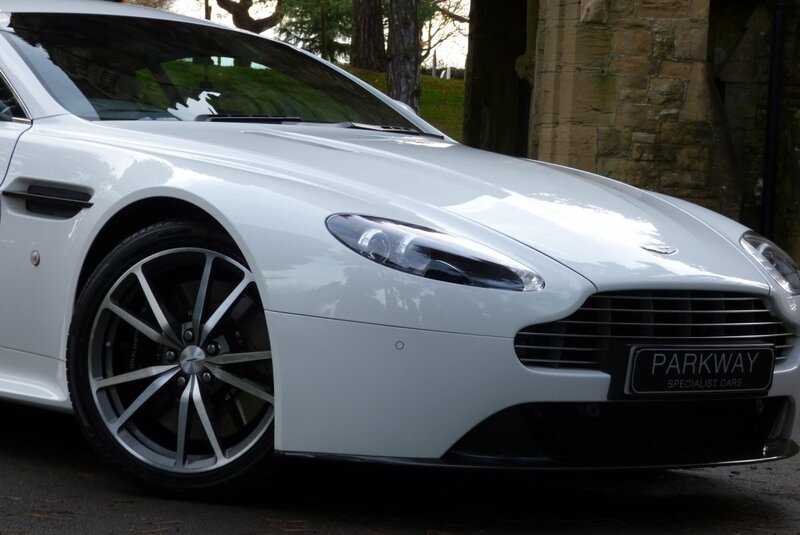 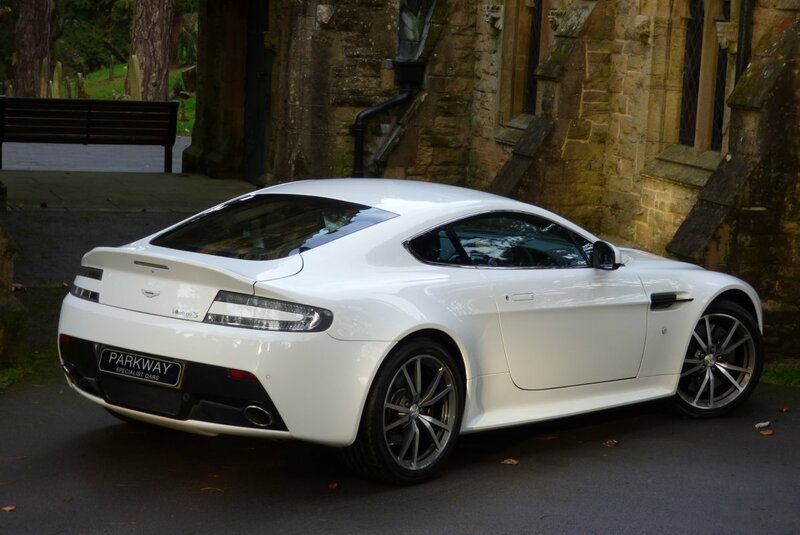 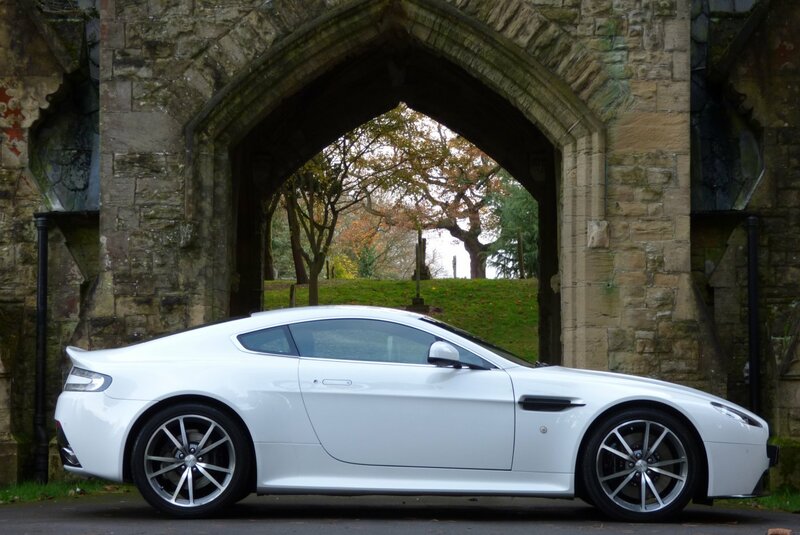 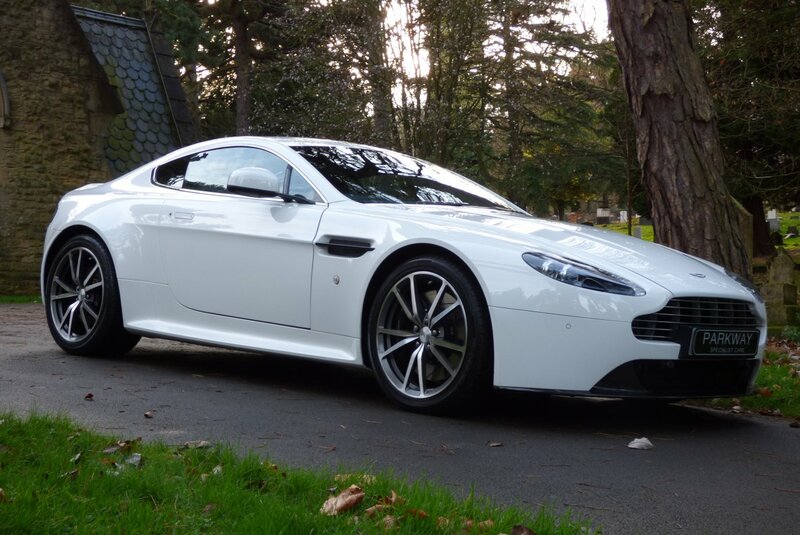 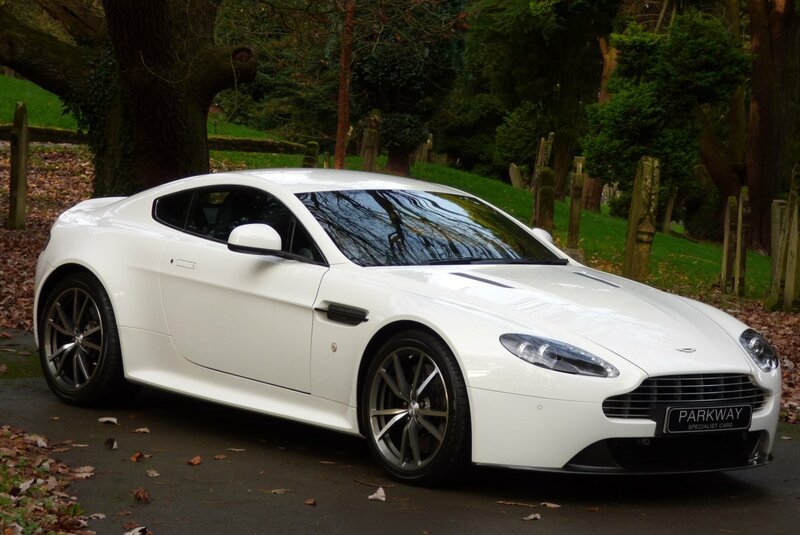 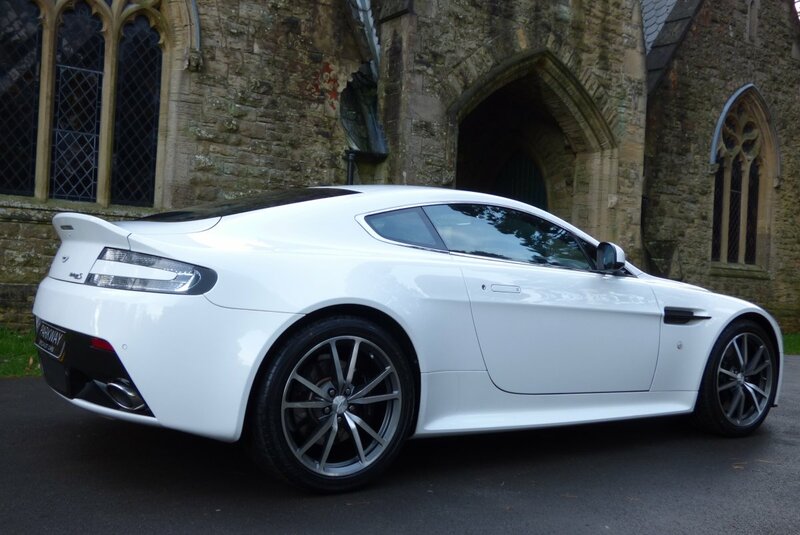 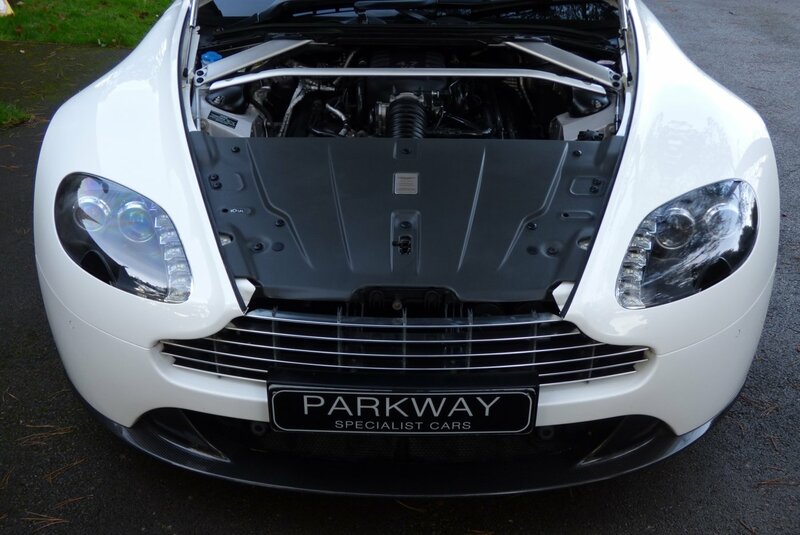 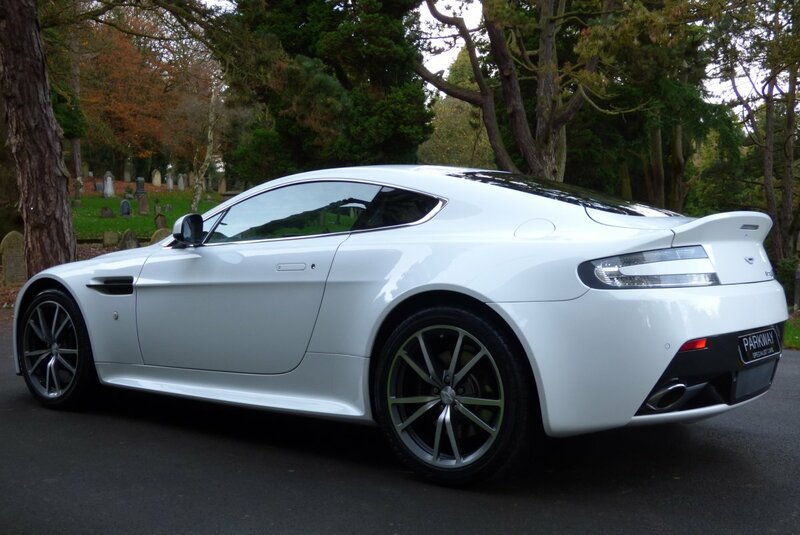 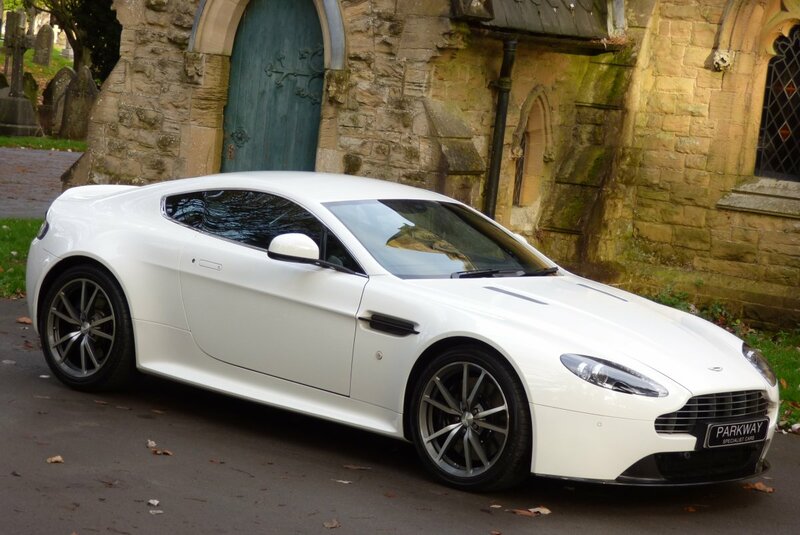 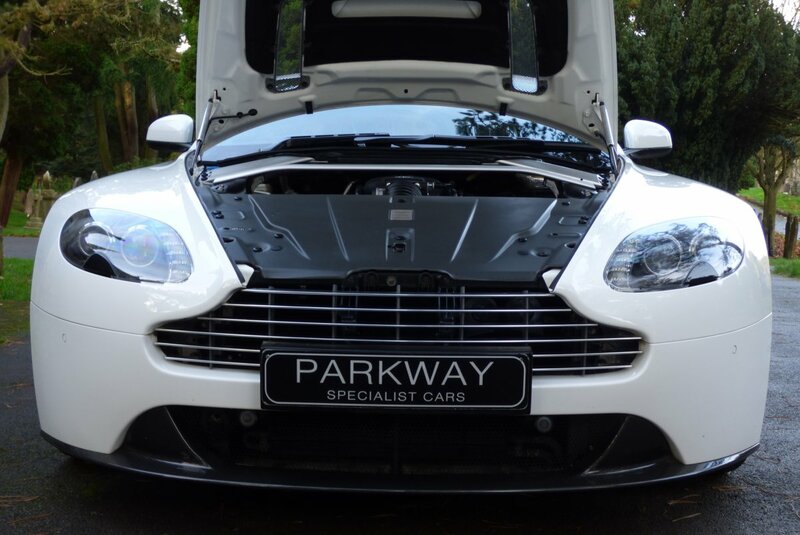 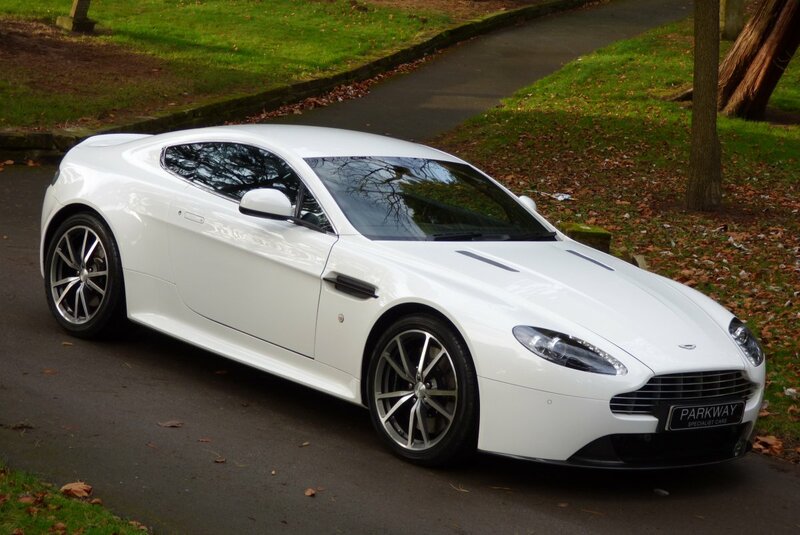 Also Offered With This Remarkable Low Mileage Vantage S Will Include An Aston Martin Premium Warranty Which Will Run Until September 2019, The Entire Booklet Pack Set Presented In The Leather Folder, A Factory Build Sheet, A Fully Functional Key Set And A Fully Cleared Hpi Certificate, For Ready For The Next Lucky Keeper To Enjoy And Cherish During Their Ownership. 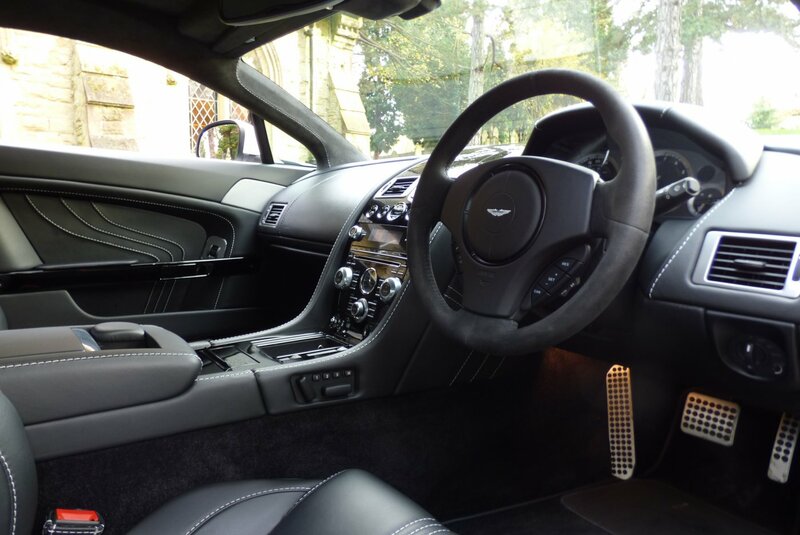 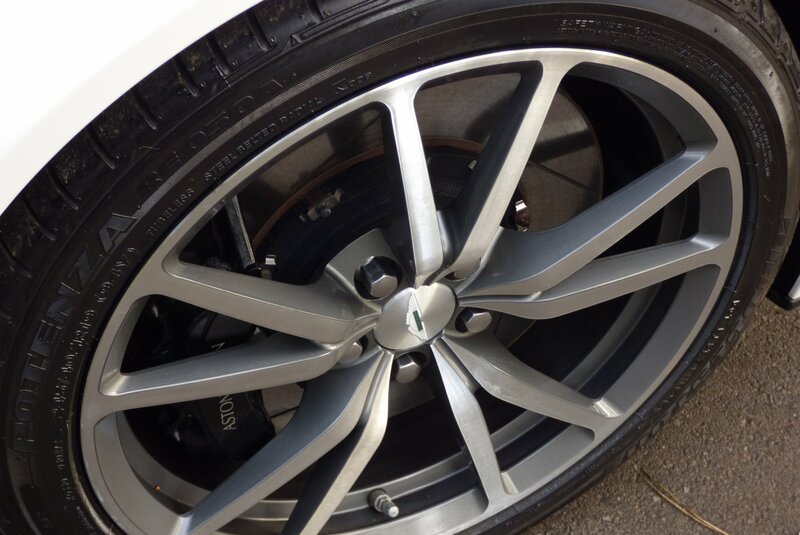 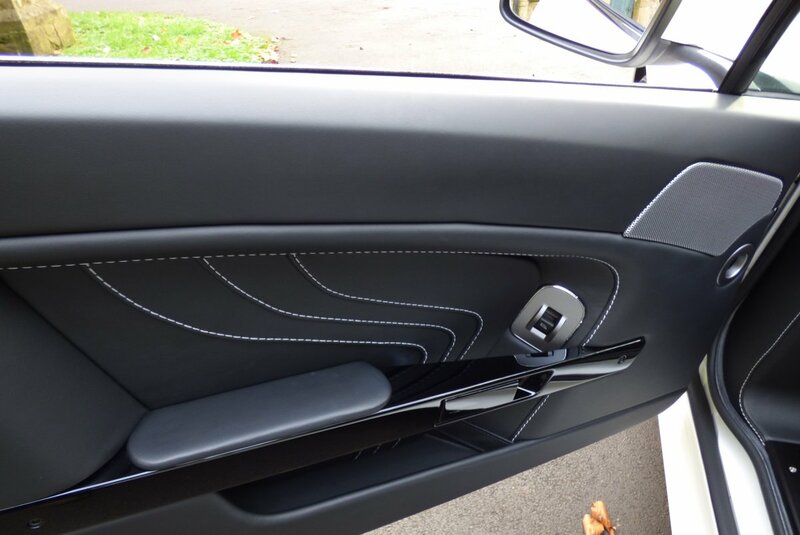 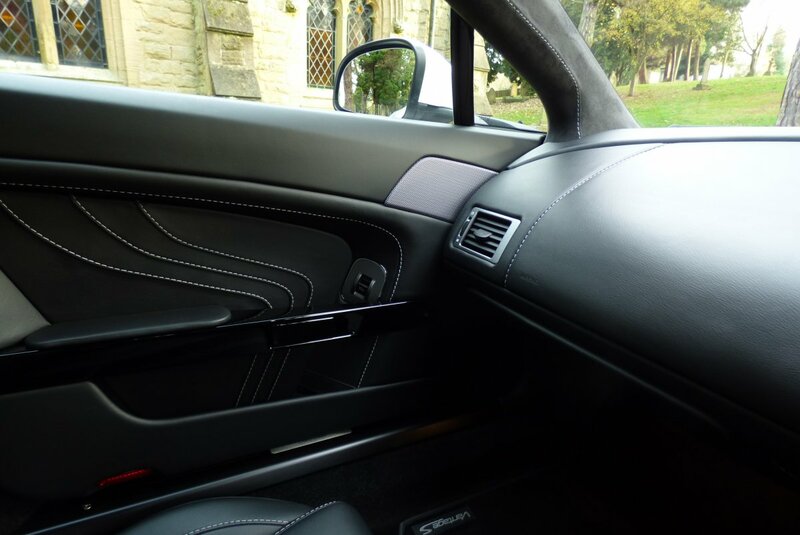 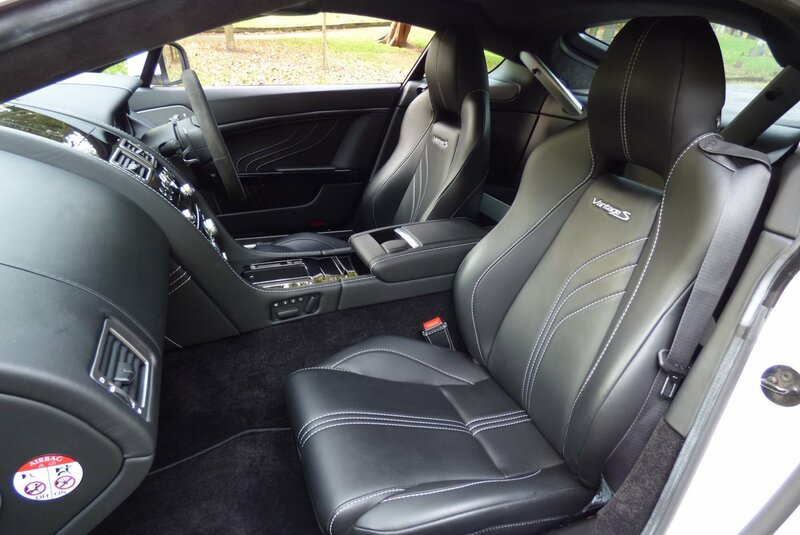 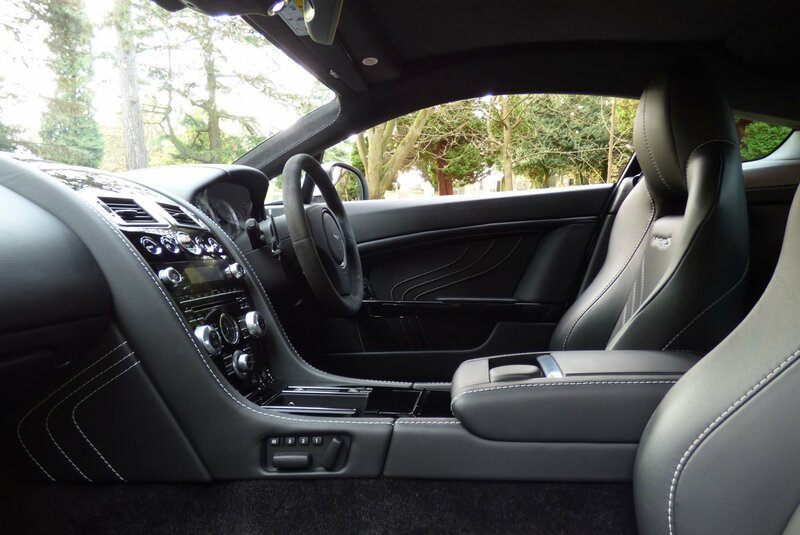 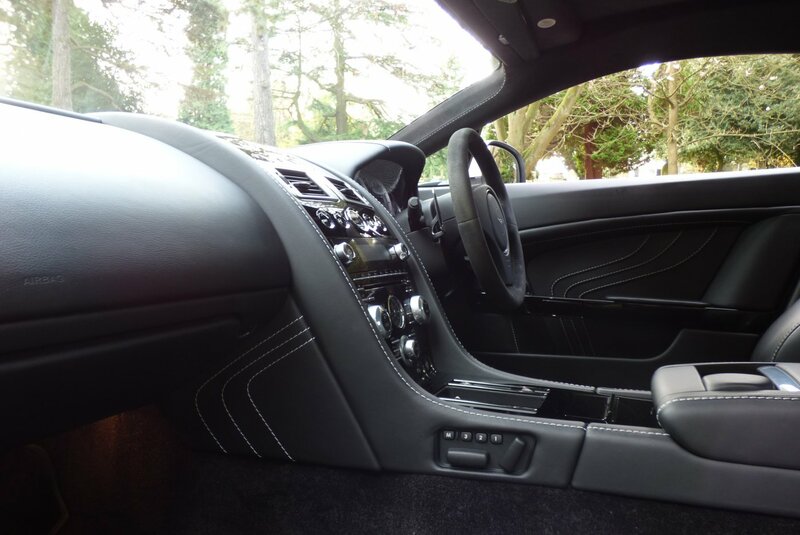 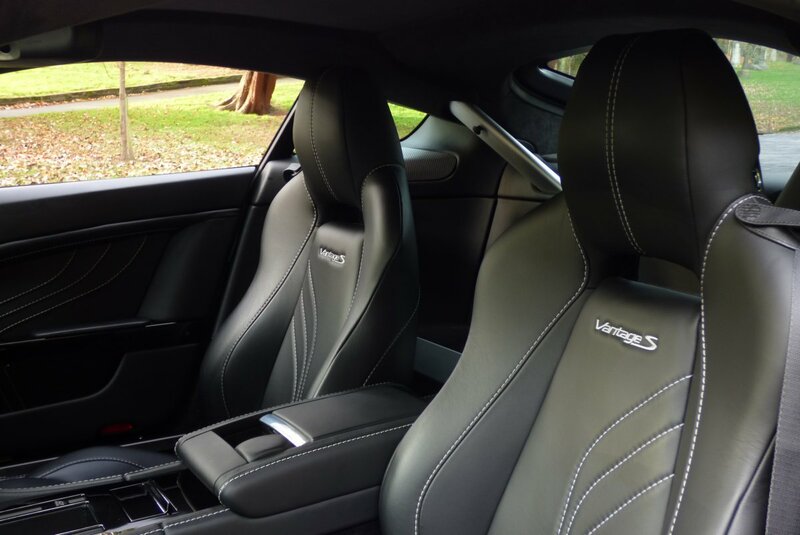 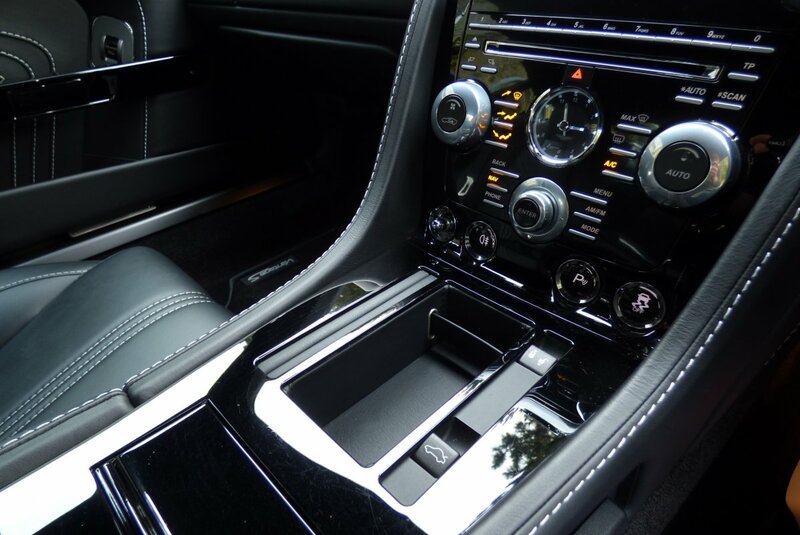 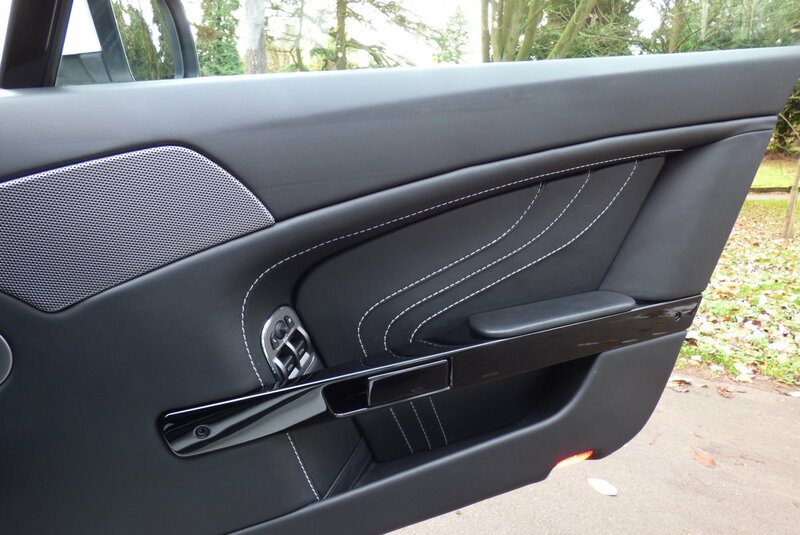 Stepping Into A Vantage S Offers That Unmistakably Aston Martin Theatre, With Only The Finest Leather Hides And Materials Used, Thus Making And Achieving A Luxurious Exciting Place To Be. 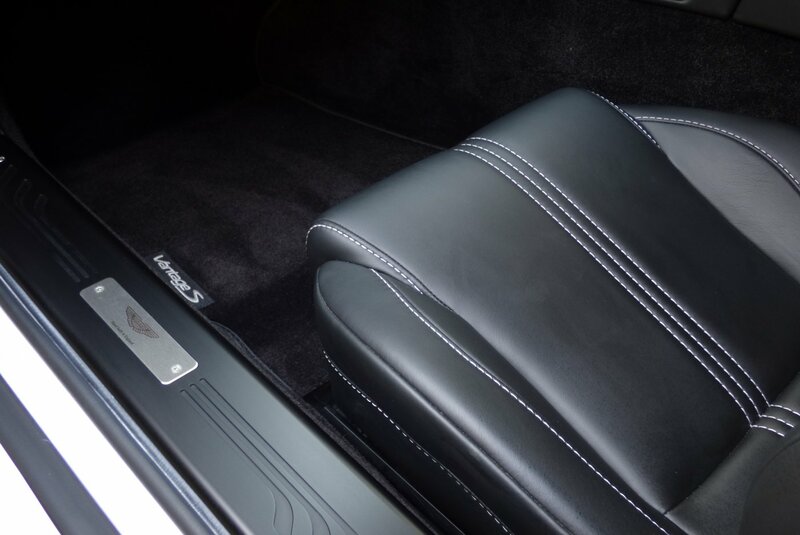 Our Car Is Opted From Factory With The Vantage S Embossed Obsidian Black Leather Sport Seats Beautifully Complemented With Silver Twin Needle Stitch Detail, Obsidian Black Leather Dash That Wraps Around This Elegant Space, Obsidian Black Leather Trimmed Door Cards Decorated With Silver Stitch, Primary Black Carpets, Obsidian Black Suede Roof Lining And Piano Black Inlays That Finish This Effect Off So Very Well. 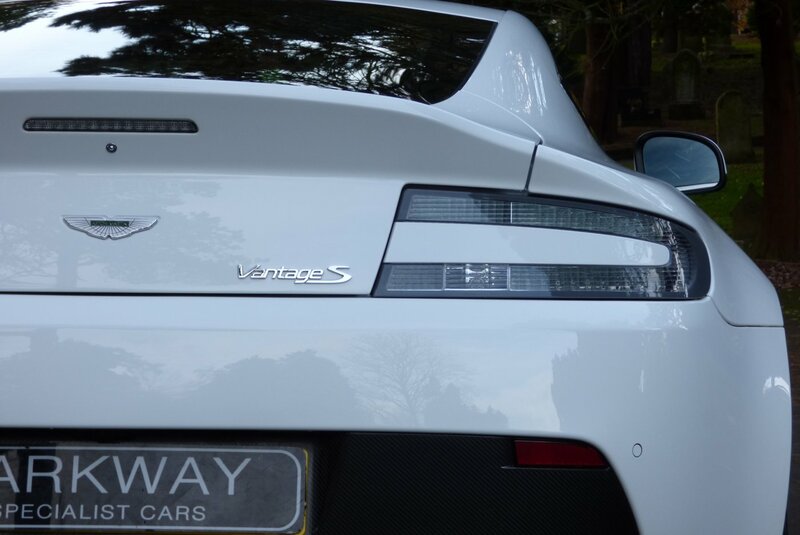  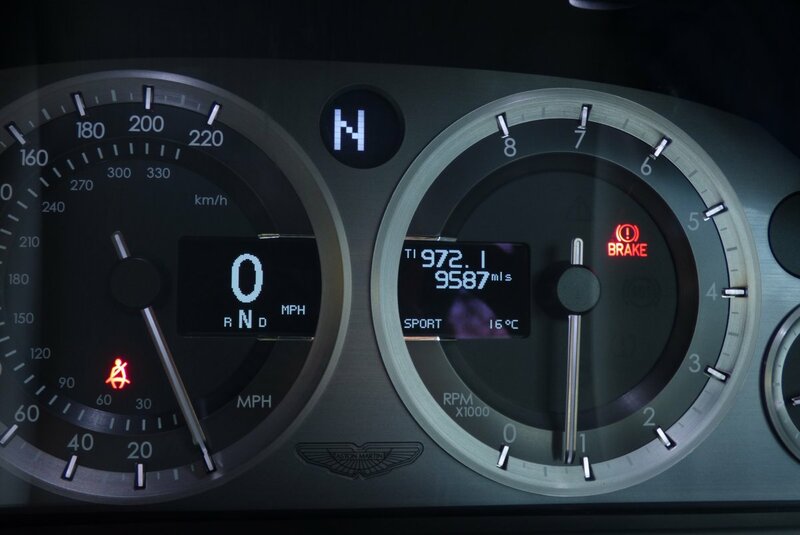 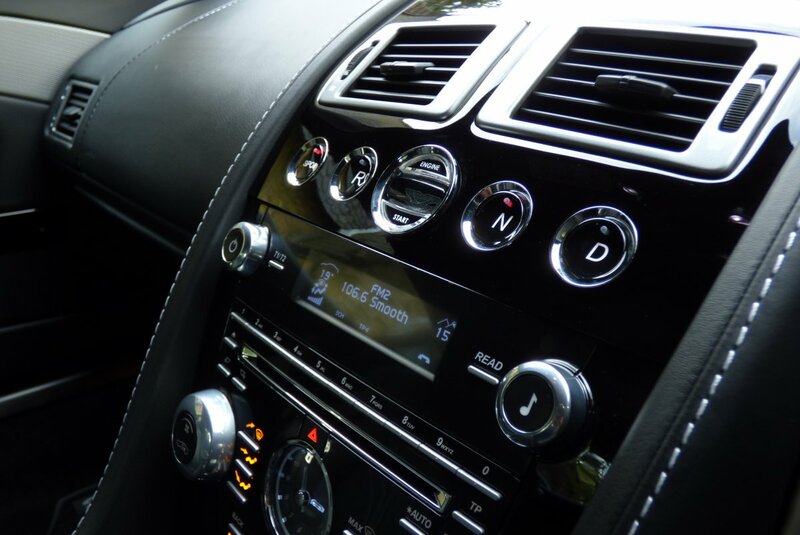 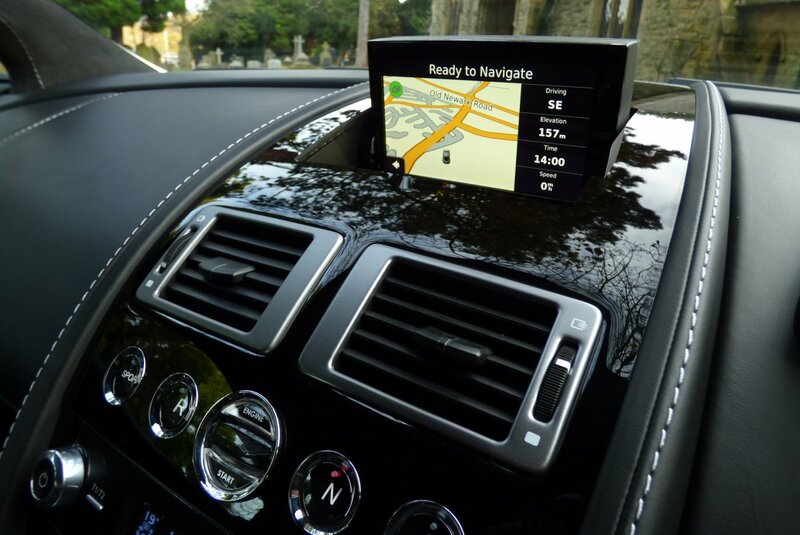 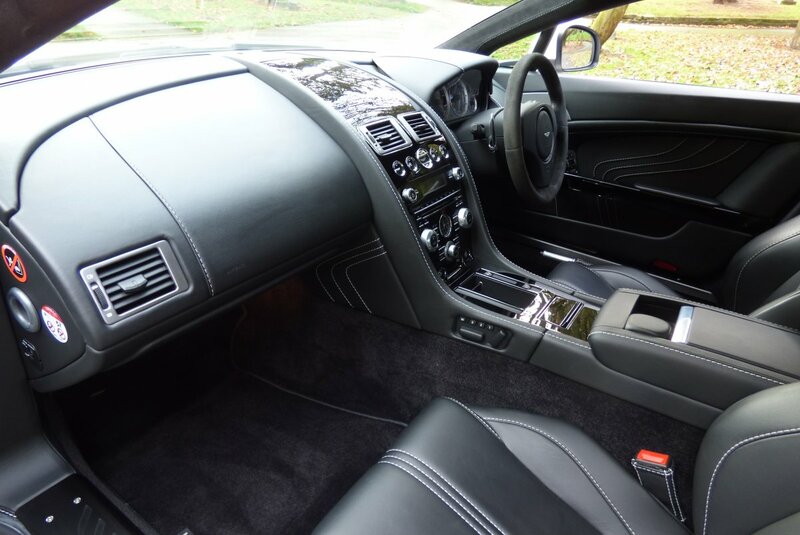 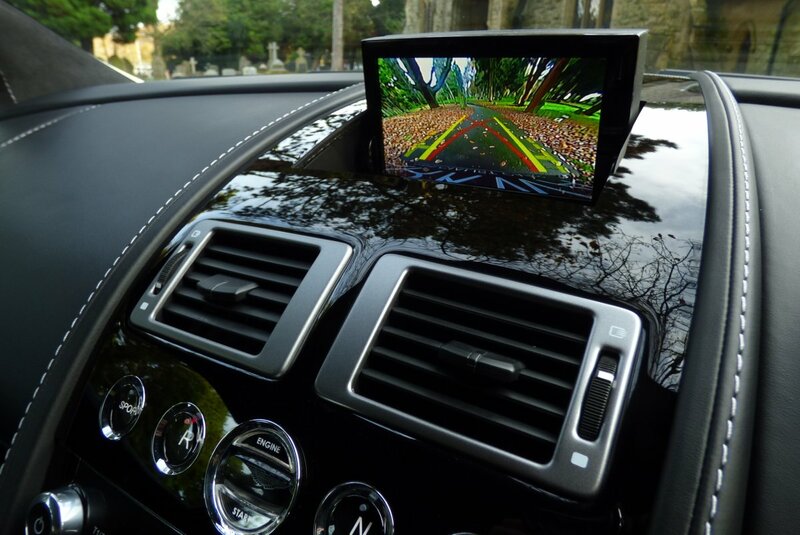 The Vehicle Is Also Packed With An Extensive Array Of Top End Aston Martin Technology Meaning That Every Trip Is Perfectly Controlled, Yet Highly Enjoyable, No Matter The Distance. 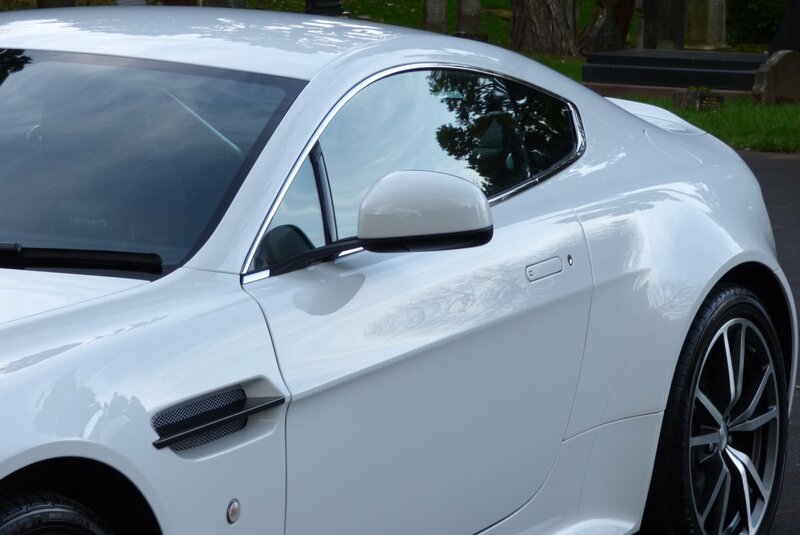 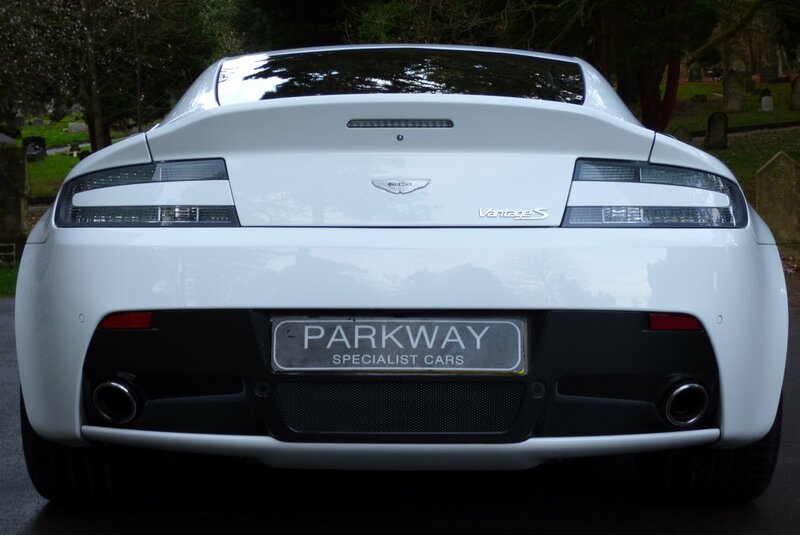 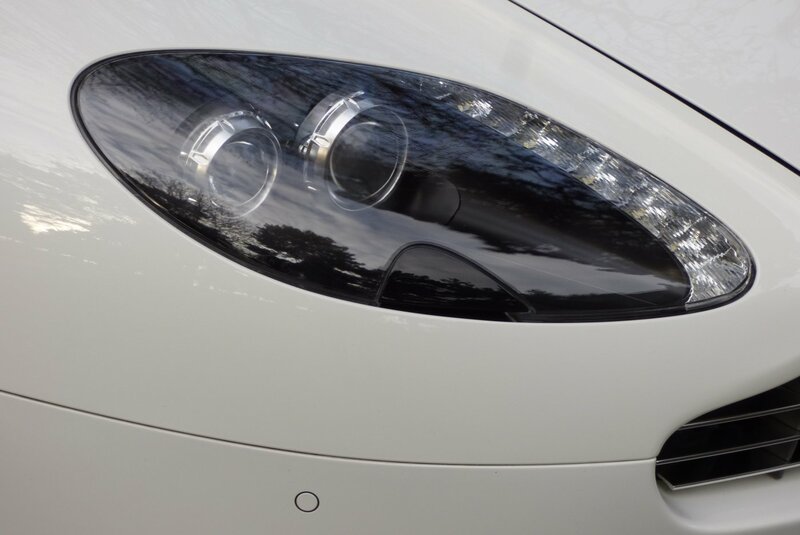 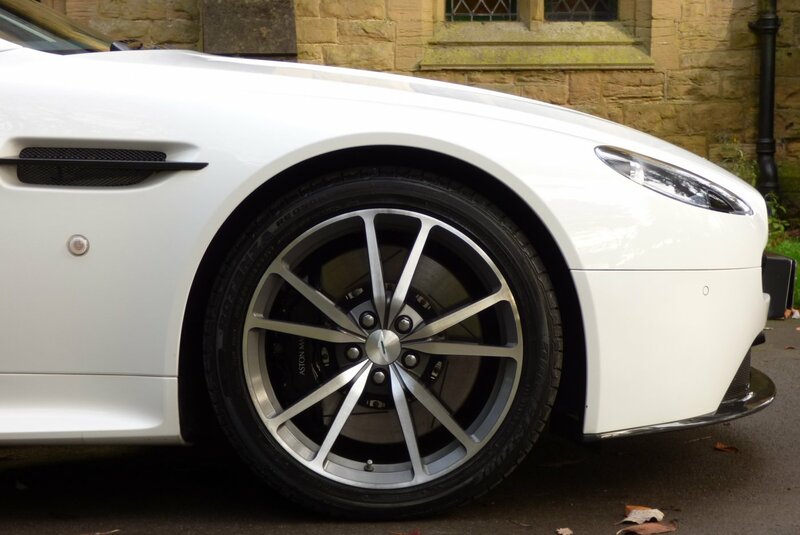 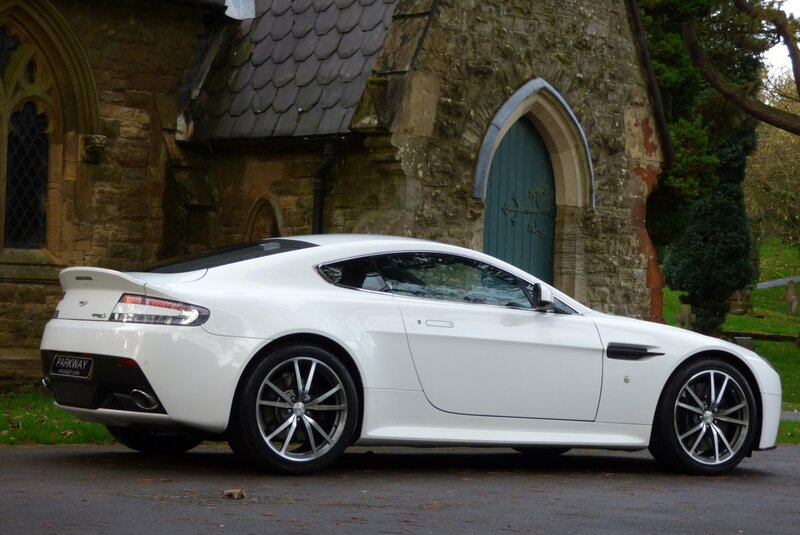 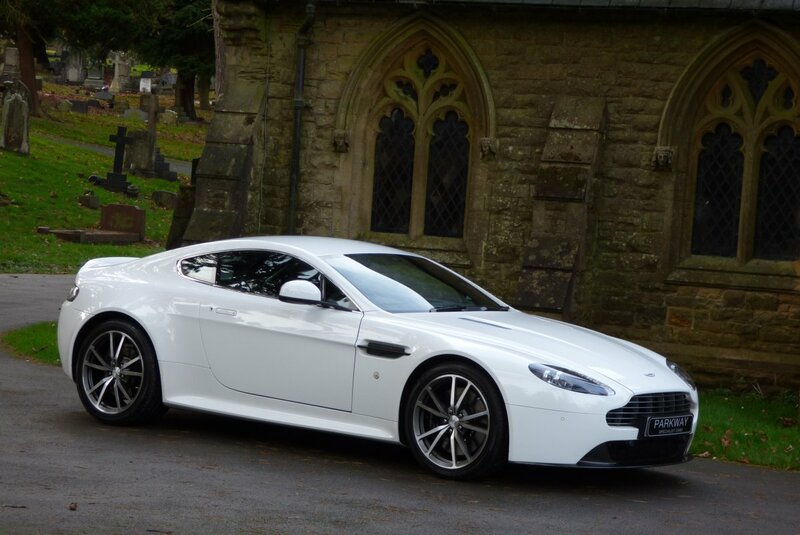 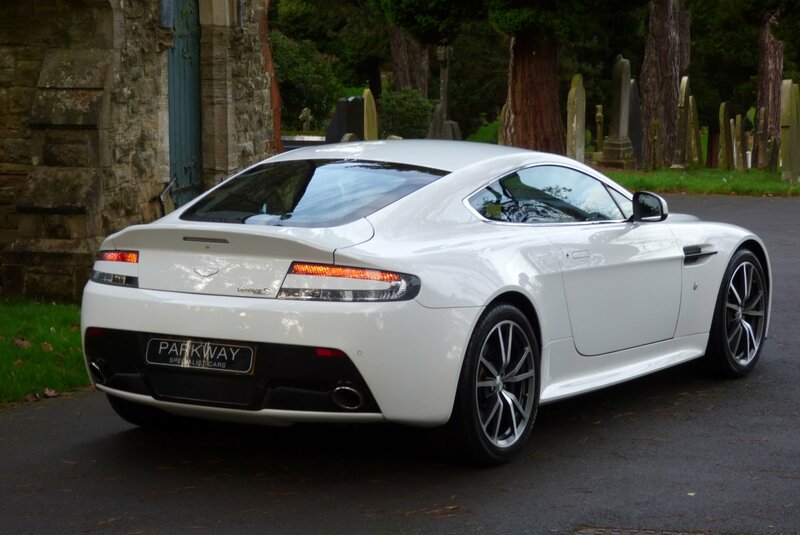 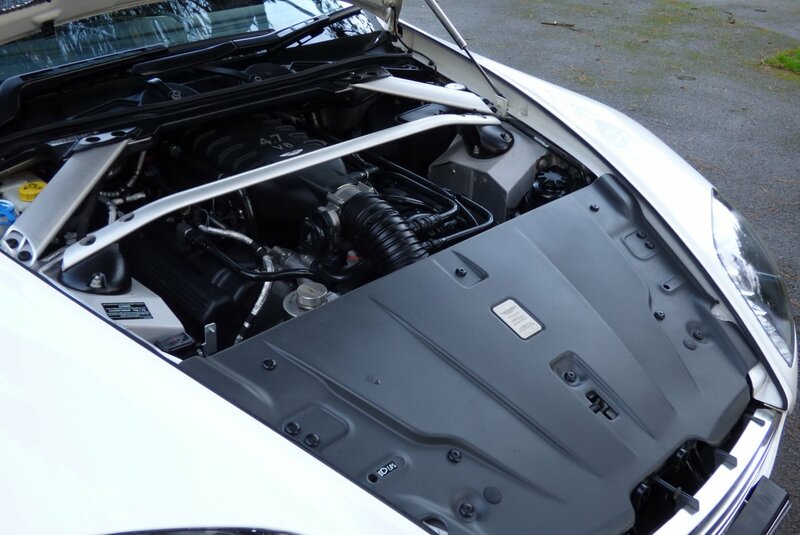 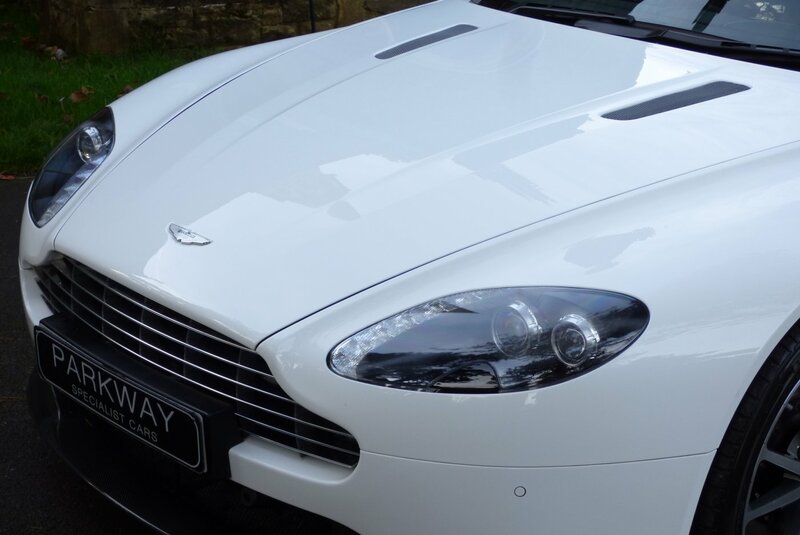 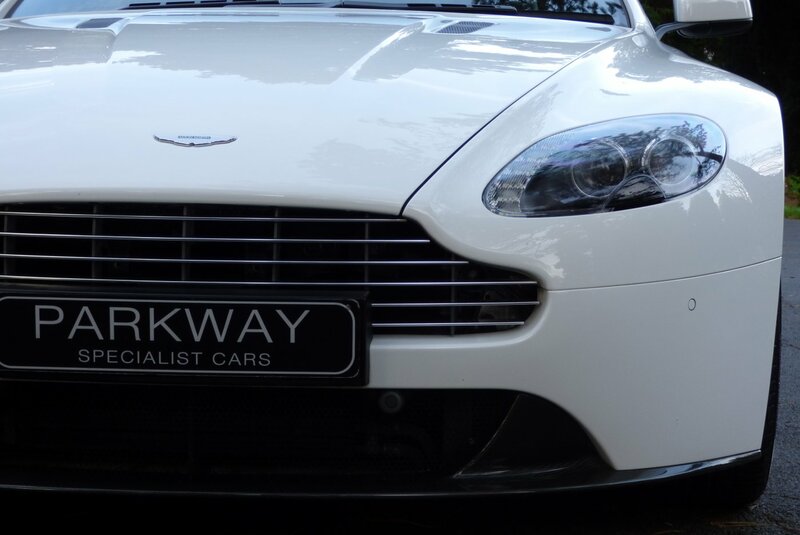 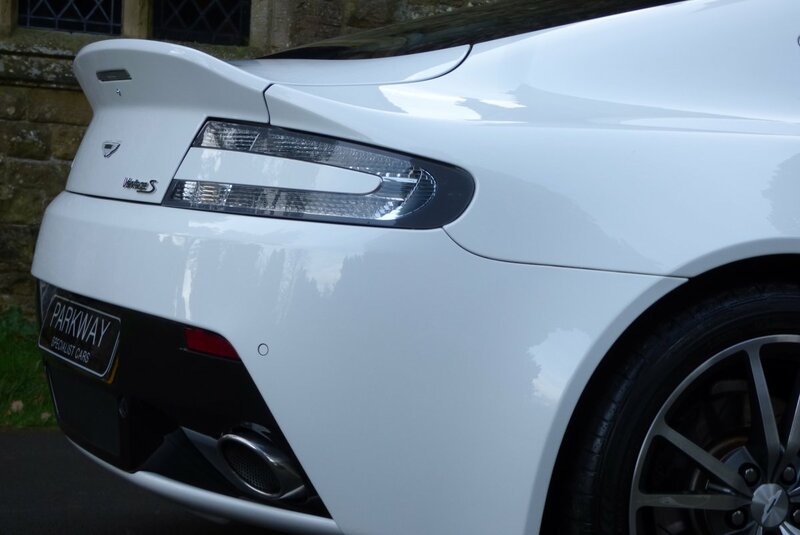 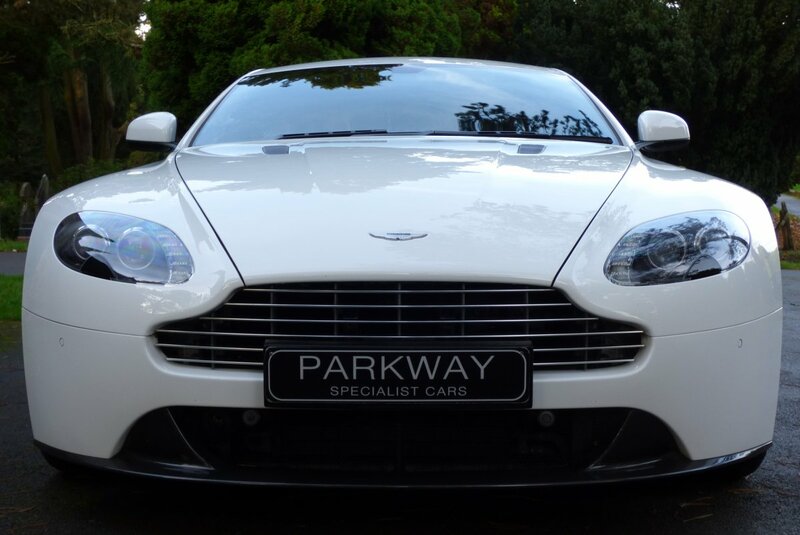 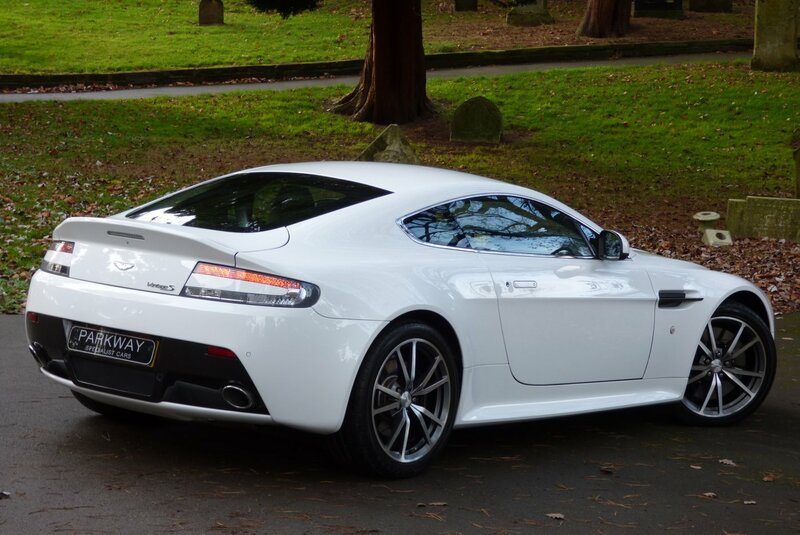 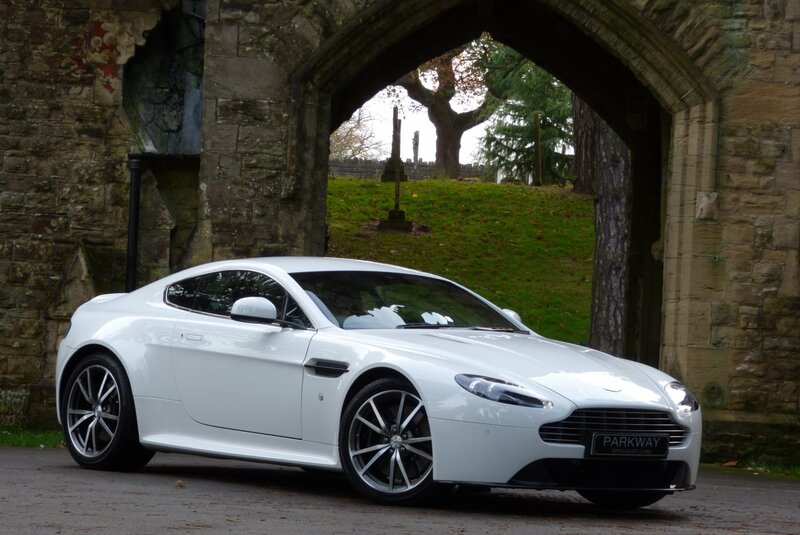 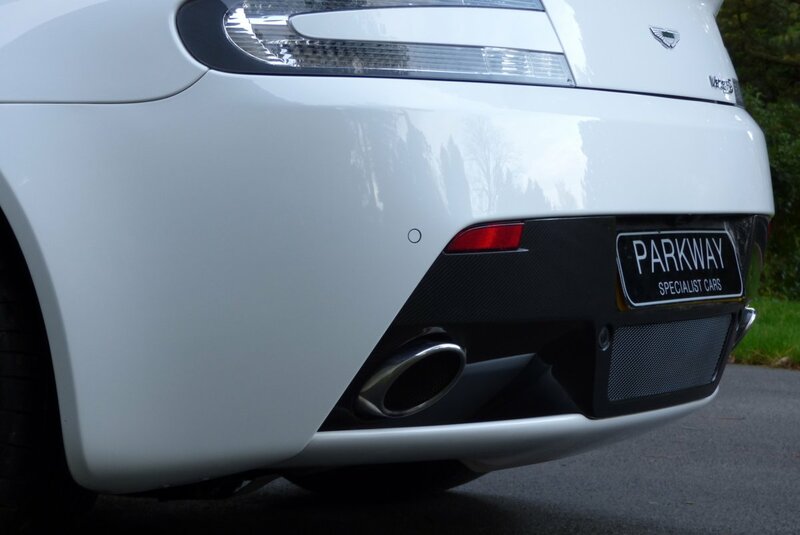 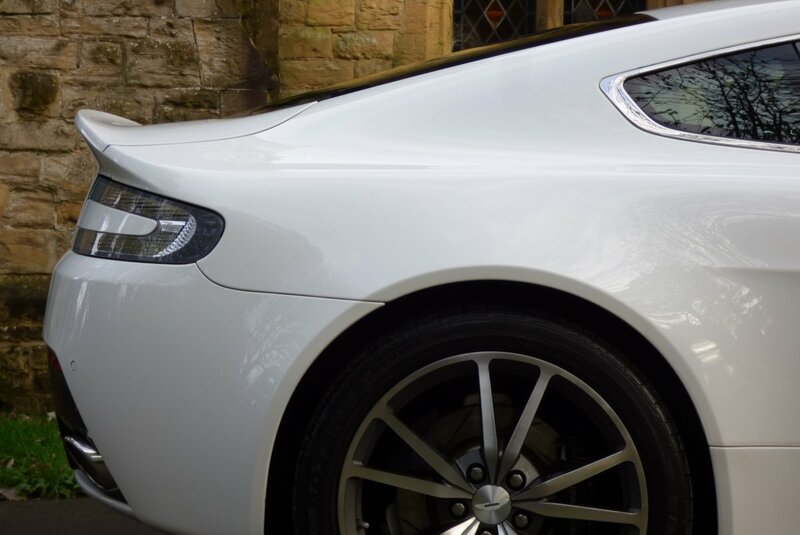 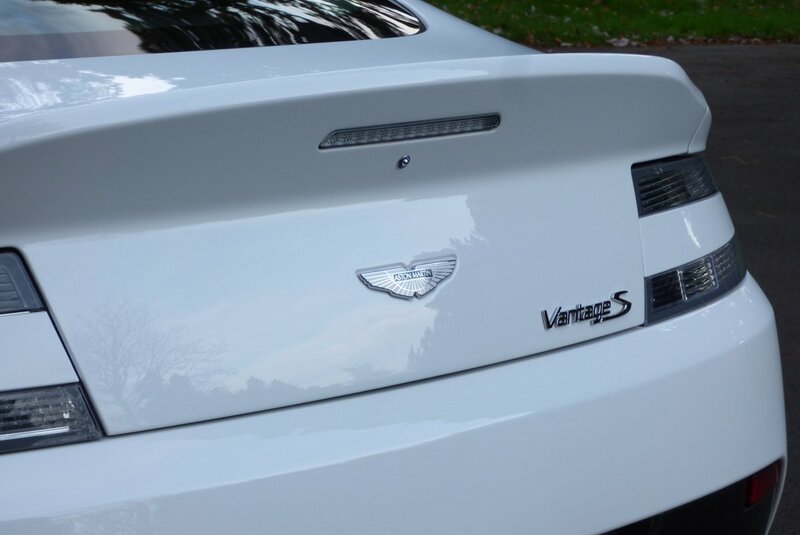 The Aggressive Body Is Presented Beautifully In The Rare Contemporary Stratus White, Which Perfectly Demonstrates The Aggressive Vantage Body Curves And Distinctive Aston Martin Lines. 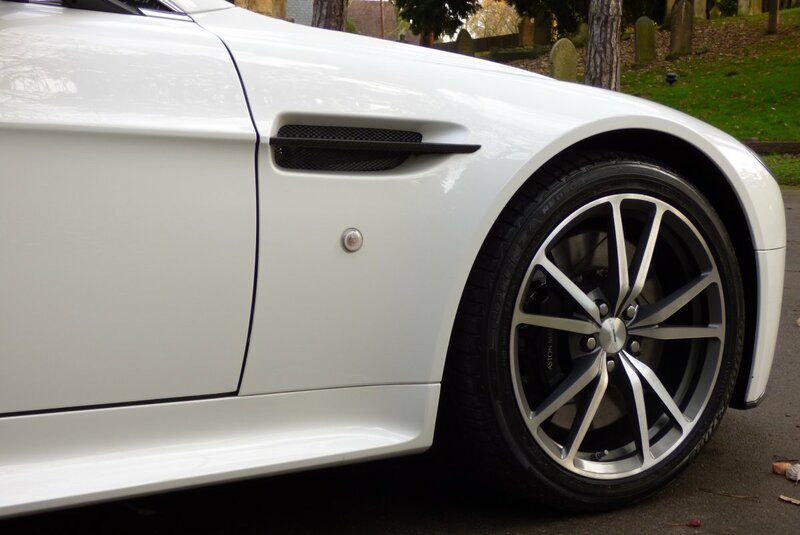 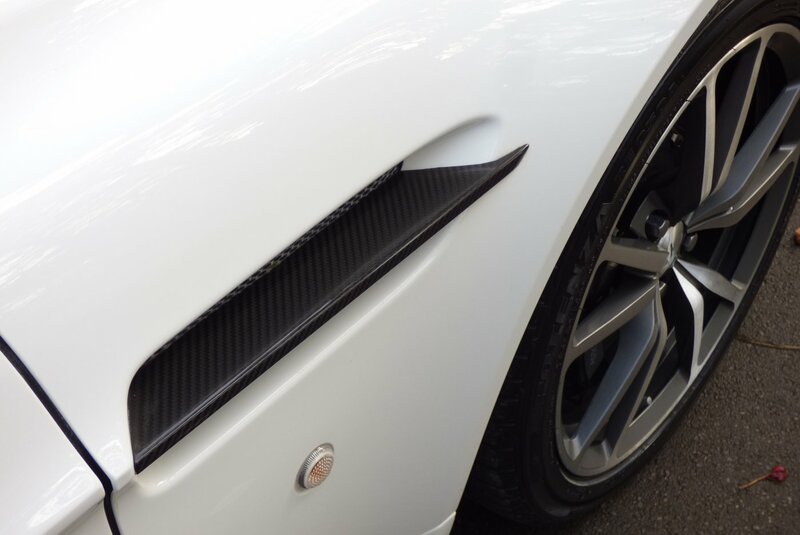 Further Exterior Features Include The Graphite Diamond Turned 19" V Spoke Alloy Wheels Which All Sit On Branded Tyres, The Carbon Fibre Front Lower Valance, The Chromed Twin Exhaust Tips, The Carbon Fibre Side Wing Blades, The Bright Silver Front Grille, The Carbon Fibre Rear Bumper Valance, The Cleared Rear Lights And Finished With The Powerful Chromed Vantage S Motifs. 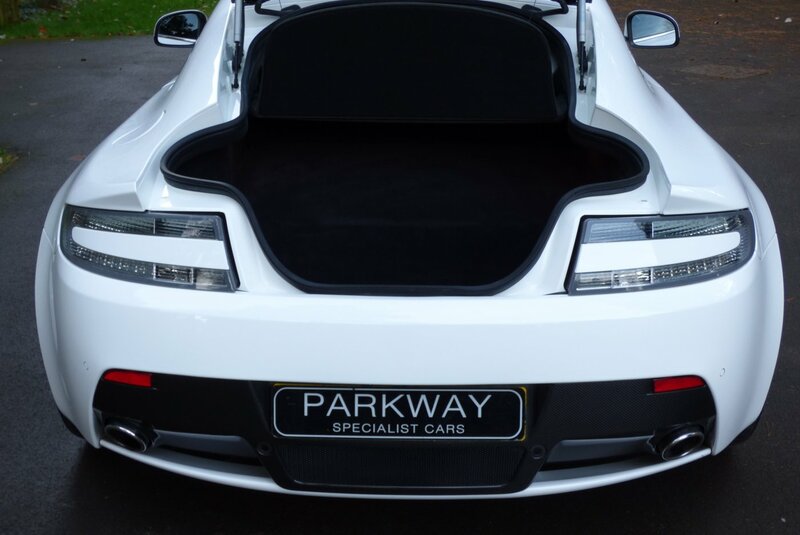 The Vehicle Looks Staggeringly Beautiful From Every Angle And Would Be Well Suited For That Trip Into The City Or That Planned European Grand Adventure.